The use of drones on the border, and the militarization of Tohono O’odham sovereign land, heads the list of the most censored issues in Indian country. Tohono O’odham activists who fight the militarization of their lands, and abuse by Border Patrol agents, are oppressed by the elected Tohono O’odham government, and targeted and abused by the US Border Patrol. Among the most secret issues are spy towers and drones. Currently, Tohono O’odham are reporting drones in the skies, but very little is known about these drones. Censored News continue extensive research into the secrecy and militarization at the border. Researching Tohono O’odham and drones, the first surprise is to see that the elected Tohono O’odham government scheduled a special session of the legislative council for a tour of the drones at Libby Army Airfield at Sierra Vista, Ariz., on Jan. 31, 2011. The purpose was a tour of Customs and Border Protection’s unmanned aircraft systems, also known as UAVs or drones. Sierra Vista is where the Army Intelligence Center at Fort Huachuca is located, and the site of protests over its role in torture at Abu Ghraib and production of the torture manual of the School of Americas. The manual was made public in 1996, after decades of torture and assassinations by US trained military in Central and South America. Already in the past month, two secret plans have been exposed by Censored News involving the Border Patrol on Tohono O'odham land. Currently, the Border Patrol is scouting three Tohono O’odham districts to construct new spy towers, after the billion dollar boondoggle of the last border spy towers that did not work. The Tohono O’odham government approved by resolution the Border Patrol’s current visits to the districts. The Border Patrol is targeting 14 sites for new US spy towers on tribal land. Censored News also exposed the fact that the Border Patrol is planning a massive new complex on Tohono O’odham land, in Pisinemo District, with housing for 32 agents, helicopter launch pad, horses and dogs. Further, more O’odham land would be seized for a transmission corridor to the north. The plan was kept secret from the public until the draft environmental impact statement was discovered the same day that public comments closed in September. Thirteen months ago, on Sept. 14, 2011, the Tohono O’odham Nation gave preliminary support for this massive Border Patrol complex, without telling the public, as revealed in another council resolution. The Tohono O’odham Nation also gave permission for the US military to be involved in construction of the complex. When it comes to drones, few subjects are wrapped in so much secrecy. 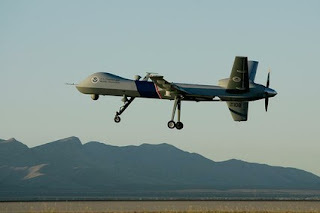 Testimony before Congress revealed that the Border Patrol operates the Predator B drones fly, primarily at night, and patrols the US/Mexico border. This includes the stretch between Yuma and Nogales, Ariz. The Tohono O’odham Nation is located between the two cities, on their traditional O’odham homeland. One of the few public statements about the use of drones on Tohono O’odham land is a disturbing one. The University of Arizona entered into a joint agreement with the Tohono O’odham Nation, for a project that supposedly focused on range land management. The agreement allowed the University of Arizona to collect a large amount of information on Tohono O’odham archaeology, cultural sites and geography. The three year project included the university’s Dr. Hermann F. Fasel, professor at the UA Department of Aerospace and Mechanical Engineering. Dr. Fasel headed the drone componenet of the project and the creation of a drone with a seven foot wingspan, supposedly for monitoring Tohono O’odham rangelands. The rangeland project also encouraged Tohono O'odham students to work for companies like Raytheon Missiles. Equally disturbing is the fact that Dr. Fasel doesn’t just work for the university. Dr. Fasel is a military contractor who works with the US Air Force and private corporations, including Boeing. In Tucson, at Davis Monthan Air Force base, soldiers operate the remote control killer drones that have been responsible for targeted assassinations and the killing of civilians in other countries. Meanwhile, Boeing received the contract for construction of the border wall in Arizona and the previous flopped spy towers. On Tohono O'odham land, Boeing was responsible for digging up the remains of O’odham on their land for the border vehicle barrier. As for the drone maker, the rangeland project states Dr. Fasel is recognized for his pioneering research in Computational Aerodynamics and Fluid Dynamics. “His research has been and is currently funded by Federal government agencies and private corporations. Examples of these funding agencies include: the Department of Defense, the Air Force Office of Scientific Research, NASA, Army Research Office, Office of Naval Research, Daimler Chrysler and the Boeing Company. Directly related to the proposed effort is his past development and flight testing of a UAV for the United States Air Force and this current participation in the development and flight testing of a long endurance UAV (also for the Air Force; in subcontract to The Boeing Company). His UAV expertise will be crucial for developing and operating an UAV based system for on-demand aerial imaging for range land management,” the rangeland project states. As previously reported by Censored News, the drone maker Advanced Ceramics entered into a joint venture with the Tohono O’odham’s San Xavier District, which borders Tucson. The business included the University of Arizona’s drone design program. Since that time, Advanced Ceramics has produced drones at a site on Tohono O’odham land close to the Tucson International Airport. The project, involving research for high temperatures and ceramics, was first accepted and then rejected by the Pascua Yaqui Nation, which considered the project too risky. 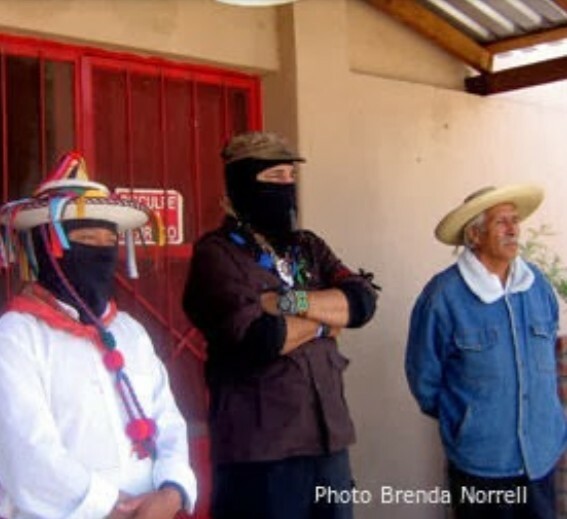 Tohono O’odham human rights activists continue to oppose the production of drones for the purposes of spying and targeted assassinations. Tohono O’odham say the violation of human rights, and taking of human life, violates the Him’daag, the sacred way of being. Brenda Norrell has been a news reporter of American Indian news for 30 years. She began as a reporter for Navajo Times, during the 18 years she lived on the Navajo Nation, where she was also a stringer for AP and USA Today. After serving as a longtime reporter for Indian Country Today, she was repeatedly censored, then terminated by ICT, and began publishing Censored News, now in its seventh year. Unfortunately I have the feeling that Big Brother is just using you guys as practice for the rest of us, with the ultimate end being no more rights to go as we please, say as we please, grow and eat as we please, publish as we please, unite together in protest against what they are doing to peoples all over the planet, creating "cover wars" to maintain access to oil and or whatever else they can profit from including drugs etc.etc.etc. Meanwhile the majority of America sleeps, constantly treading water just to maintain their jobs so they can pay the rent, buy food, gas,clothes and the next generation is being kept busy pressing tiny buttons, playing games or passing nothing back and forth to each other, being shoved through school with no real education to show for it and no hope for college or higher learning unless they have the money for it. It's all want want want, need need need, buy buy buy until it will become Bye Bye Bye folks ! How to stop/change it ? This web we call the Internet is one of the most powerful things that we have that we can use to make positive change and keep informed with all of the people the World over. Government is subservient to Big Greed Business, we only have each other and the power that unification brings left folks. They Do Not Own Us, They Do Not Own Our Beautiful Mother Earth which Belongs To All the People, Not Big Greed Government ! The very act of seizure of Native Land proves that Manifest Destiny is still alive and kickin' and it won't be long before we all feel that boot kickin' us all if we don't wake up. Guess I'm just not Prayin' hard enough or often enough myself. America has always, since the European incursion, been a place of destruction and violence. The last 12 years have been worse. I found this blog researching for an article on military pollution (for opednews.com). There is no difference between the government and corporations. The debate tonight reminded me of the movie Robocop, only with no hero or happy ending.